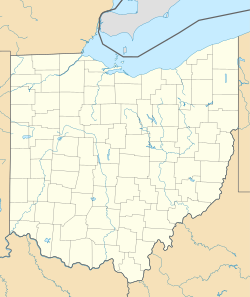 Historic Kirtland Village, located in Kirtland, Lake County, Ohio, is the name given to a historic site (itself made up of historic buildings and sites important to the early Latter Day Saint movement). The village is owned and operated by The Church of Jesus Christ of Latter-day Saints. The Church purchased the first property in the village, the Newel K. Whitney Store, in the late 1970s, and restored it in 1984. In the years since then, the Church acquired more historic buildings and property in the area. In April 2000, plans were announced to restore the remaining buildings, while reconstructing others, and building a new visitors center. Following the completion of the project, Church president Gordon B. Hinckley dedicated the site on May 18, 2003. ^ "Newel K. Whitney Store". Mormon Historic Sites Registry. Mormon Historic Sites Foundation. Retrieved 8 April 2011. ^ Anderson, Karl Ricks (2002). "Historic Kirtland Taking Shape". Site & Scene. Mormon Historic Sites Foundation. 4 (1). Retrieved 8 April 2011. ^ Shaun D. Stahle (24 May 2003). "Historic Kirtland, Ohio: Once-bustling community restored to 1830s beauty". Church News. Retrieved 8 April 2011. This page was last edited on 8 November 2018, at 17:41 (UTC).